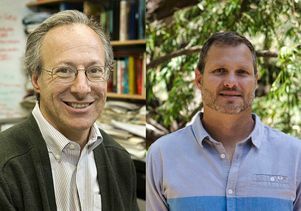 With both Robert Wayne, left, and Paul Barber named as HHMI professors, UCLA is tied for second in the United States in the number of 2017 recipients. Paul Barber and Robert Wayne, both UCLA professors of ecology and evolutionary biology, have been selected among 14 scientists nationally by the Howard Hughes Medical Institute as HHMI professors. 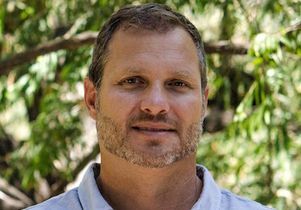 Barber will receive $1 million over five years and Wayne will share $1.5 million over five years with Beth Shapiro, professor of ecology and evolutionary biology at UC Santa Cruz, to develop new interdisciplinary approaches to important challenges in science education. The awards, which were announced today, recognize excellence in research and education. UCLA is tied for second in the United States in the number of 2017 recipients with Stanford University, UC Santa Cruz and Cornell University; University of Texas at Austin has three recipients. Barber’s HHMI Diversity and Health Disparities Program at UCLA is designed to improve the success of students from underrepresented minority groups who intend to go to medical school. While most underrepresented minority STEM undergraduates are pre-med and committed to becoming doctors serving their largely minority communities, few end up going to medical school. “By creating a supportive and collaborative community that fosters students’ passion for solving health disparities, this program will help maintain students’ commitment to STEM majors during a vulnerable period when they are most likely to leave science,” Barber said. “For students who continue on the pre-medical track, this program will make them more competitive medical school applicants, and more aware of the drivers of health disparities within their communities. “For students who choose not to pursue medicine, the program will expose them to alternate career paths where they can pursue their passion for health disparities through research, providing research experience that will prepare them to join research laboratories and making them competitive for graduate school and STEM careers,” Barber said. Barber’s research integrates genetics, genomics, ecology and oceanography to understand the evolution of marine biodiversity. He uses this information to promote marine conservation. The research program developed by Wayne and Shapiro, with initial support from a grant from the University of California Office of the President, uses a highly sensitive molecular approach called environmental DNA, or eDNA, to catalog biodiversity in California ecosystems. As part of the CaleDNA project, students and citizen scientists collect soil and sediment samples from critical environments in California to establish biodiversity baselines of life, ranging from microbes to mammals. By sampling a sediment core, biodiversity changes can be mapped over time with environmental change, Wayne said. This project has collected several thousand samples — mostly through the efforts of undergraduates and citizen scientists during “bioblitzes” — all of which are available to researchers who want to study biodiversity and ecosystem processes, including the effects of human disturbance on natural ecosystems. The success of this field effort and the excitement it generated for science was the basis for Wayne and Shapiro’s proposal to HHMI. Given their experience with eDNA field collection and scientific study, Wayne and Shapiro will use the HHMI award to enhance interest and participation in science with the goal of recruiting more students to STEM education and increasing their appreciation for scientific thinking. The program, called eSIE, which stands for Environmental DNA for Science Investigation and Education, will involve three tiers. 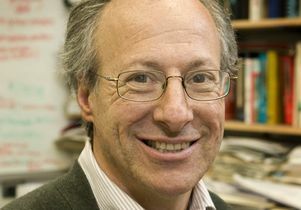 The first will center on conducting observation and sample collection that will whet the appetite of new UCLA students, especially non-STEM majors and undecided undergrads, for studying life sciences, and will provide a direct experience in the natural environment, so often missing for many undergraduates from cities, Wayne said. The second tier will involve a new foundation course as a general education offering for incoming freshman that will use eDNA as a tool to teach students many of the fundamentals of biology, from microbiology to genomics to community ecology and conservation. It will also expose new undergraduates to microbes, plants and animals, and provide access to online lectures, which will be followed by coming to class and breaking into small groups to solve science problems. The third tier will draw on graduates of Tier 2 who decide to pursue a career in science and provide them with guidance about appropriate courses given their interests and provide access to research labs. The goal of the program is to educate and interest thousands of students in the process of science, a small subset of whom may become scientists, but all of whom will have a better appreciation and understanding of the application of scientific principles to problems in biology, Wayne said. 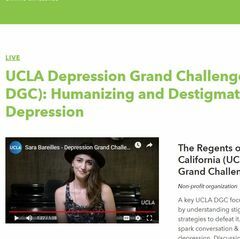 Wayne and Barber both expressed their gratitude to the Howard Hughes Medical Institute and to Erin Sanders, director of UCLA’s Center for Education Innovation and Learning in the Sciences, for her support in preparing their proposals. Among previous winners of HHMI professor awards is Utpal Banerjee, the Irving and Jean Stone Endowed Chair in Life Science at UCLA. Undergraduates in his functional genomics course conducted original research on the fruit fly’s genes and development — work that led to publications in peer-reviewed scientific journals with more than 250 student authors. Tracy Johnson, a UCLA professor who holds the Maria Rowena Ross Term Chair in Cell Biology and Biochemistry, and Aydogan Ozcan, the Chancellor’s Professor of Electrical and Computer Engineering at the UCLA Henry Samueli School of Engineering and Applied Science, were selected by HHMI in 2014 for their innovative approaches to undergraduate education. In addition, Johnson in June was awarded a five-year $1 million grant from the institute as part of its Inclusive Excellence initiative. 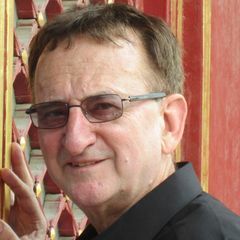 Robert Goldberg, a UCLA distinguished professor of molecular, cell and developmental biology, is another former HHMI recipient. He created a program to teach undergraduates about the excitement of discovery, how advances in biology are rapidly transforming our lives, and how much effort, imagination and creativity go into experimental research. Robert Wayne, left, and Paul Barber, both UCLA professors of ecology and evolutionary biology. Previous Story Launch of Latino Policy and Politics Initiative is true to its mission Next Story What might it take to create a truly stretchable phone or huggable robot?